Five prison guards were placed on leave after two convicted killers from the Cummins Unit in Grady escaped by putting on jail guard uniforms and walking to a waiting car. Correction Department Spokeswoman Dina Tyler said Monday the five officers are on unpaid leave while the department investigates the Friday evening escape of Jeffrey Grinder and Calvin Adams. Tyler would not name the five officers, but said they were guarding the entry and exit points of the prison. Among the jobs for inmates at the Cummins Unit is making uniforms for jail guards and law officers. Video surveillance shows the men put the uniforms on in the prison library after the 6 p.m. headcount and walked out of the prison unchallenged during a shift change less than 20 minutes later, Tyler said. Grinder and Adams drove away in a car that was waiting for them. Police have continued to look in southeast Missouri for the convicted killers. Tyler said the department is investigating how the inmates got the uniforms and were able to leave the prison without anyone noticing something was amiss. 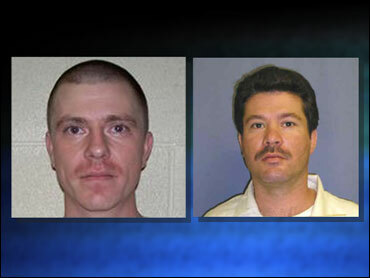 Grinder, 32, and Adams, 39, were each convicted of capital murder and were serving life sentences without parole. Correction Department spokeswoman Dina Tyler says the men were spotted Saturday in two southeast Missouri communities, Hayti and Braggadocio. She said Monday that the agency believes those sightings were legitimate. Other reported sightings in Texas and Arkansas have been discounted by investigators. Tyler says Adams has relatives in the Bootheel area and there is no reason to believe the men have moved on. "We still think the probability is they are in the (southeast Missouri) area," Tyler said Monday. Grinder and Adams are believed to be traveling together. Tyler said Adams know the southeast Missouri region. "They could have slipped past us, but we are holding our ground there," Tyler said. Tyler said the agency is investigating how the prisoners got the uniforms. "We know that they used officer uniforms and they walked out the front," Tyler said. "We don't know where the uniforms came from, but the suspect has to be the garment factory." Authorities are also trying to find out who left the automobile for the fugitives. Adams is from Leachville and was convicted of capital murder in 1995 in the 1994, kidnapping and shooting death of banker Richard Austin, 25. Austin's wife was wounded and was able to walk more than a mile for help. Grinder is from Yellville and was convicted of capital murder, aggravated robbery and burglary in the 2003 beating death of Pat Gardner, 77, who lived near Springdale. Tyler said investigators are still trying to develop information that could lead them to the fugitives. Anyone who knows where Adams and Grinder may be is asked to call authorities.